When Cindy Hyde-Smith, the first female senator from Mississippi, stood before a room brimming with supporters on a Friday in a northern pocket of the state about seven miles from Southaven — where President Donald Trump rallied for her last month — she delivered an impassioned, pro-Trump closing argument in her soft-spoken southern twang. "It is so great to be here," she began. "When President Donald Trump came into Desoto County and I got to ride in the motorcade with him … Seeing the streets lined with people trying to get a glimpse of the president, what a great day that was for Desoto County, what a great day that was for Mississippi and for the country." Trump might not be on the ballot in Mississippi, but in the Senate special election to replace retired Sen. Thad Cochran, the two GOP candidates — Hyde-Smith and conservative firebrand and state Sen. Chris McDaniel — are each crafting a path to victory that is heavily dependent on the White House. 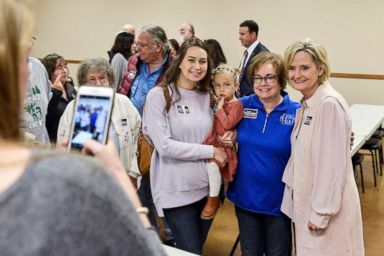 Sen. Cindy Hyde-Smith, right, poses with supporters during a campaign stop at the Northwest Mississippi Association of Realtors office in Nesbit, Miss., Oct. 26, 2018. In one of this cycle's quirkiest races, the Senate special election is a four-way nonpartisan "jungle primary," in which multiple candidates from both parties compete and no party labels are featured on the ballot. In addition to a challenge from her right by McDaniel, Hyde-Smith is facing a challenge from her left by Democrat and former Clinton cabinet secretary Mike Espy and Democrat and former Navy intelligence officer Tobey Bartee. If none of the candidates receive a majority of the vote on Nov. 6, the top two finishers, regardless of party, will advance to a runoff on Nov. 27. Much like a primary, this special election is pitting one establishment Republican against a conservative insurgent, and both are staking their campaigns on their loyalty to Trump to win over his base. As Trump continues his campaign blitz, he has sharpened his party’s final message for voters heading into Election Day — making his pitch a referendum on his administration’s central issues, including the caravan of migrants marching towards the United States and Justice Brett Kavanaugh’s contentious confirmation process. "This will be an election of Kavanaugh, the caravan, law and order, and common sense," he declared at a rally in Missoula, Montana in October, and repeated that line at subsequent rallies in Houston, Texas, and Murphysboro, Ill. This mantra has become a rallying cry as he crisscrosses the country to shore up support for Republican candidates and maintain the GOP’s majority in Congress in the final days of the midterm elections. Trump stopped in Mississippi in early October to bolster Hyde-Smith's candidacy, since the special election could potentially decide the balance of power in the Senate. Hyde-Smith currently stands as the frontrunner in the race, according to a recent NBC News/Marist poll, although she still remains shy of clearing the 50 percent threshold needed to win outright on Tuesday. On the trail, Hyde-Smith is stitching the president’s remarks into her own, showing her fealty to Trump with voters. "We’ve got a president that is a leader," she told the small crowd in Nesbit, Miss. "He is a leader. They talk about the caravan headed for the border down there, we’ve got somebody that can handle that caravan. There’s no doubt in my mind." U.S. Senate candidate Chris McDaniel answers a voter's question at a meet and greet dinner in Taylorsville, Miss., Sept. 6, 2018. Hyde-Smith is currently serving in Cochran’s seat after being appointed by Gov. Phil Bryant on March 21. Her resume showcases a long political career in Mississippi politics, previously serving as the state's Agriculture Commissioner from 2011 until her appointment to the Senate, as well as formerly serving as a state senator for 12 years beginning in 1999, when she was elected as a Democrat. The former Agriculture Commissioner switched to the Republican Party in 2010, but in 2008, she voted in the state’s Democratic primary for president. Hyde-Smith's former party affiliation has been her greatest hurdle in the race, as McDaniel continues to weaponize her Democratic ties. Despite not revealing who she voted for in 2008, McDaniel repeatedly claimed that the former Democrat voted for Hillary Clinton. "I understand that as a lifelong Democrat who voted for Hillary Clinton, it might be difficult for Cindy Hyde-Smith to advocate vocally for one of President Trump's Supreme Court nominees, but Mississippians are counting on her to stand and fight for them in the U.S. Senate," he said in a statement provided to ABC News last month. After nearly defeating Cochran in 2014 in a primary challenge, McDaniel decided to run again this cycle. Boasting name recognition across the state and riding anti-establishment fervor, he first mounted a bid in the Senate race against incumbent GOP Sen. Roger Wicker. 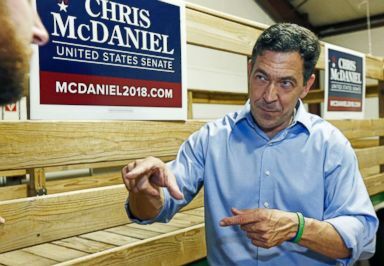 After Cochran resigned, McDaniel jumped into the special election race in March, encouraged by former Trump adviser Steve Bannon, to contest the establishment’s hold on the seat. The former conservative talk show host, seeking to fuel his outsider candidacy with support from Trump's base, has relentlessly challenged Hyde-Smith every step of the way on her loyalty to the president. Despite failing to secure Trump's endorsement, which was clinched by Hyde-Smith, McDaniel has taken some unconventional steps to garner approval from the White House, including inviting supporters to show up to the Trump rally for Hyde-Smith. "Show the President that Trump Country is McDaniel Country," an email to supporters read. He has also consistently claimed that Trump was "forced" into endorsing Hyde-Smith by the Washington establishment, primarily Senate Majority Leader Mitch McConnell. McDaniel, in a statement from October, opined that as the only "lifelong" Republican in the race, on Election Day, "Mississippians will ultimately do the right thing." 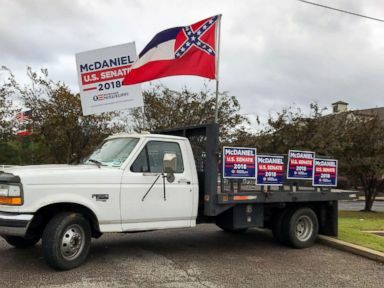 Over the weekend, at a Hyde-Smith campaign event in Nesbit, a truck clad in McDaniel campaign signs that read "Remember Mississippi," parked as close as possible to the venue, seemingly trolling the incumbent senator. A truck covered in Chris McDaniel campaign signs sits parked outside of a campaign stop for opponent Sen. Cindy Hyde-Smith in Nesbit, Miss., Oct. 26, 2018. But marring McDaniel's chances is a campaign fraught with controversy of his own making. During an interview on MSNBC, when asked how he would speak to the state’s African-American population, which is one of the largest in the country, the state senator responded, "After 100 years of begging for federal government scraps, where are you today?" Their bitter rivalry came to a head as the Kavanaugh hearings rattled Washington. In an apparent show of loyalty to Trump, McDaniel told American Family Radio in September of Kavanaugh accuser, Christine Blasey Ford's claims, "These allegations, 99 percent of the time, are just absolutely fabricated." He also urged Hyde-Smith to fight "tooth and nail" to confirm the judge, cornering her into issuing a full-throated embrace of Kavanaugh. Recalling the Kavanaugh hearings, after accepting a "women for Kavanaugh" t-shirt during the weekend campaign stop, she told the crowd of the hearings, "When we say it was brutal, that is an understatement." "It was unbelievable, but I want you to know that we did the right thing by Brett Kavanaugh," she asserted. Hyde-Smith is adamantly positioning herself as the ultimate champion of the Trump agenda, and in an interview with ABC News in Nesbit, she brushed off any concerns about her former Democratic party affiliation. "I'll tell you, anybody in Mississippi that is over 40 years old, they voted for a Democrat because we were a Democratic state many years ago," she said. "[I] have a very conservative voting record that I’m very proud of, so really that is a non-issue." Pushing an ardent defense of the president’s policies, Hyde-Smith added, "I know firsthand that we have got to secure those borders." "It is a must, we cannot allow this to go on any longer," she continued. Sen. Cindy Hyde-Smith speaks with a reporter in front of her tour bus, which features a photo of her and President Donald Trump, during a campaign stop in Nesbit, Miss., Oct. 26, 2018. When pressed on Trump's often heated rhetoric on immigration, she evaded the question, instead telling ABC News, "I cannot speak for the president, I can only speak for myself." 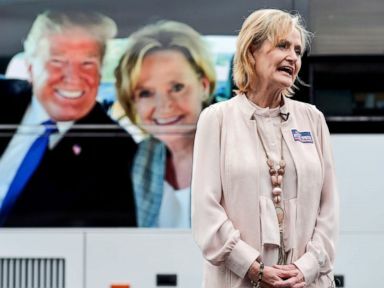 Standing before her campaign tour bus, which features a blown-up selfie of the senator and the president plastered on the side, she praised Trump for bringing prosperity to Mississippi, pointing to the tax cuts the GOP passed this year as a signature achievement of the Trump administration and for the Magnolia state. "The tax cuts have been huge for our state," she said. "The environment that he has created to allow us to prosper, that is what Mississippi needs." Of all 50 states, Mississippi ranks either the lowest or among the lowest in terms of percentage of the population in poverty (19.7 percent as of 2017), education attainment (only 21 percent of the state has a bachelor’s degree or higher), and median household income ($40,528), according to the most recent information from the U.S. Census Bureau. In the deep red state, which voted for Trump by nearly 20 points in 2016, the president continues to have a favorable rating, with more than half the state approving of the president's job performance, according to the NBC News/Marist poll. 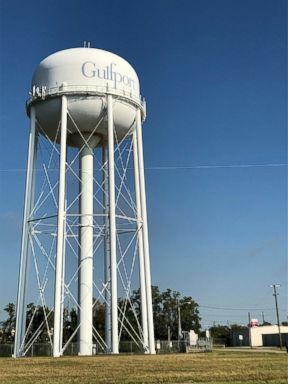 A water tower sits in the city of Gulfport on Mississippi's Gulf Coast, Oct. 28, 2018. Hyde-Smith is seizing on Trump's firm standing in the state to win over his voting bloc. Among attendees at her campaign events, some indicated that they see her as a reflection of the president and as the only candidate in the crowded field who will advance his progress. 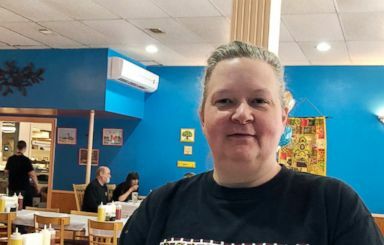 "In 2016, I voted for Trump," Janet Curtis from Nesbit told ABC News. "I am supporting Cindy Hyde-Smith and I still support Trump." When asked why he’s voting, Brandon Grace from Senatobia, said, "To make America great again. To keep the things that are going." "Like Cindy was saying," he added. In the Republican stronghold of Gulfport — which sits on Mississippi's Gulf Coast and where an overwhelming majority voted for Trump in the 2016 presidential election, according to the New York Times — when it comes to deciding between the conservative they know in McDaniel and the Trump-approved candidate in Hyde-Smith on Nov. 6, voters are weighing Trump’s endorsement heavily. Elizabeth West, 42, a resident of Gulfport, Miss., sits inside local restaurant, Petie's Eats Downtown, Oct. 28, 2018. 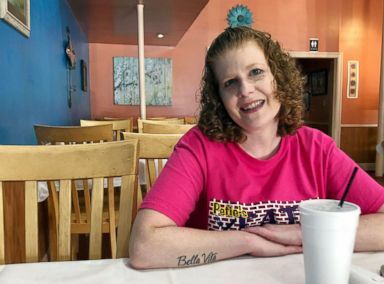 "I think that whole campaign, putting [Trump] up there on the podium supporting Cindy, that’s what we all see," Elizabeth West, 42, told ABC News in local restaurant Petie's Eats Downtown. "That goes a long way with the public. You can see the ripple effect." Another voter, Mary Cox, 50, who also lives in Gulfport and as a staunch pro-life supporter, ranked abortion as her top issue at the polls, said that a candidate's voting record signals their loyalty to Trump. "If they are loyal, they are going to follow suit," she asserted. "They are going to vote the way that the president wants them to vote." Hyde-Smith has a 100 percent Trump score, according to FiveThirtyEight. Cox conceded that initially, she supported McDaniel, but after Trump interjected himself in the race, her opinion shifted in favor of Hyde-Smith. "I was going for Chris McDaniel, then Trump backed her," she added. "I would like to take and vote for all of the ones Trump endorses. McDaniel has a very good background. Cindy-Hyde-Smith just kinda popped up out of nowhere." Gulfport resident Mary Cox, 50, sits in Petie's Eats Downtown in Gulfport, Miss., Oct. 28, 2018. "I don’t like the fact that Cindy Hyde-Smith used to be a Democrat but Trump is endorsing her," she continued. When asked if the election were held today who would she vote for, Cox said, "For Cindy Hyde-Smith just because Trump endorsed her." Already distinguished as the first woman to represent Mississippi in Congress, Hyde-Smith would also be the first woman elected to the Senate from the Magnolia State if she wins next week, or three weeks later in the likely runoff. In a year in which a historic number of woman are running for elected office, and winning, Hyde-Smith’s bid to the U.S. Senate is historic. She is among 23 female Senate candidates in a general election match-up this cycle. While her victory would secure a greater presence for women in the Senate, she is focused on keeping the GOP’s majority in this year’s midterm elections. "We need to keep on going," Hyde-Smith said. "We have so many issues facing us right now. Tuesday is an important day. It’s the jungle race, it is named correctly. These midterms are so very important." "We have to have the House and Senate that we want," she added. In a more forceful tone before the intimate audience in Nesbit, Hyde-Smith said that if Democrats win, they will "immediately" move to impeach the president. "When I tell you that impeachment proceedings would start immediately, Maxine Waters has got it on her mind," she said. "Nancy Pelosi, Chuck Schumer. It would start immediately. All these good things that we’re doing would be put to the side because of the obstruction." "It is the most serious race I have ever been involved with," she affirmed.